Heading into 2019, the story around the Massachusetts women’s lacrosse team was how much experience it had lost. The two leading scorers for UMass (5-3) in 2018, Holly Turner and Hannah Burnett, a duo that had powered the Minutewomen to three Atlantic 10 titles and sustained a record-breaking conference wins streak, graduated at the end of last year. With only two seniors and one redshirt senior on the top of the roster, UMass looked to retool behind deep freshman and sophomore classes. Instead, it’s been those three veterans – Kiley Anderson, Cassidy Doster and Hannah Palau – who have stepped into the void, leading the Minutewomen in scoring through the first half of the year. 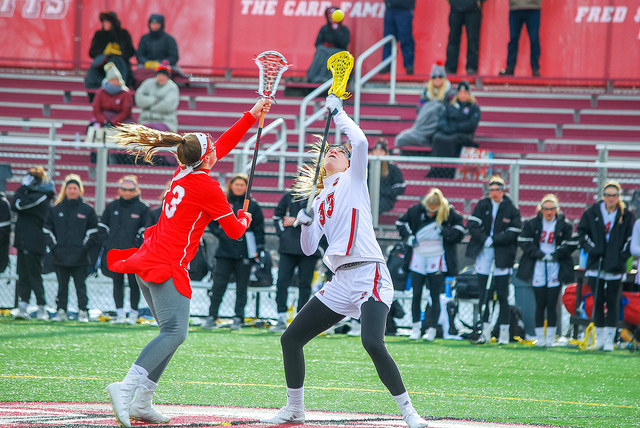 Anderson’s torrid start to the season has turned a lot of heads, as the redshirt senior’s 38 goals nearly laps the Atlantic 10 field (Richmond’s Mia Castagnero ranks second with 23). Palau and Doster, meanwhile, are easily outpacing their own career highs – Palau’s 16 goals already surpasses her career high of 15 from 2018, while Doster is on pace to almost double her career high in goals. As the Minutewomen try to work in a deep crop of younger players, those three have been the leaders for the UMass attack, both on the field and on the sidelines. Facing a leadership vacuum after the departures of Turner and Burnett, the three seniors helped steady the Minutewomen after ugly losses to No. 1 Boston College and Harvard. Now almost halfway through the season, the Minutewomen are fourth in the A-10, with conference play starting Friday at Davidson. Coming off another bad loss, this one to Dartmouth in a game where Anderson couldn’t go, UMass will again be relying on them to turn things around. Doster also credited her own improvement to having to fill Turner and Burnett’s shoes in the clubhouse. While the Minutewomen don’t depend entirely on Anderson and the other seniors to bring the offense, the three of them have picked up a lot of the slack on the field, helping UMass to a 5-3 record despite the general inexperience and an injury to starting goalie Lauren Hiller, which has kept her out for the first eight games.